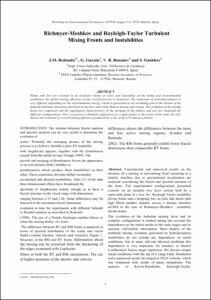 Redondo, J. M.; GARZON BEDOYA, G.; Rozanov, V.; Gushkov, S.
Plume and Jets are released in an enclosed volume of water and depending on the initial and environmental conditions, the global mixing efficiency of the overall process is measured. The behaviour of individual plumes is very different depending on the environmental energy, which is generated by an oscilating grid at the bottom of the tankself-similarity structures that form in the flow and relate them to mixing and stiring. The evolution of the mixing fronts are compared and the topological characteristics of the merging of the plumes and jets are examined for different configurations. Here we present a detailed comparison of a single plume in the centre of the tank, but also discuss the evolution in overall mixing efficiency produced by a line of up to 9 sideways plumes. Redondo, J. [et al.]. Richmyer-Meshkov and Rayleigh-Taylor turbulent mixing fronts and instabilities. A: Summer School and Workshop on Environmental Turbulence. "SSWET". Madrid: Universidad Complutense de Madrid (UCM), 2010, p. 1-14.